Press "Order Now" to calculate postage! 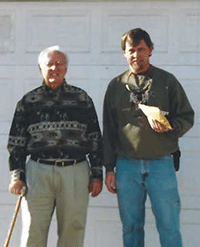 Living Products, LLC has been doing business since 1988. 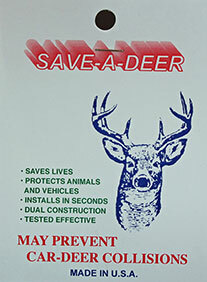 Currently, we only sell one product, the Save-A-Deer whistle. We have sold millions of these whistles over the past twenty-seven years to many businesses and individuals. This is a family owned business operating from two locations. Our product is manufactured in our home state of Missouri. We ship most orders from our secondary location in Colorado. We continue to have our product tested by independent companies for quality and performance. We are always searching for any research completed on our product. Please submit any research or experiences you may have to info@deerwhistle.com. Living Products, LLC's, policies and procedures for handling customer information have been created with the understanding that Internet technologies are still evolving and that Internet business methods are continuing to evolve to meet the needs and opportunities of the changing technologies. As a result, Living Products, LLC's, policies and procedures are subject to change. Living Products, LLC, will protect the confidentiality of its customers' information, account information, and personal communications to the fullest extent possible and consistent with the law and the legitimate interests of Living Products, LLC, its partners, its employees, and other customers of Living Products, LLC's, services. To protect the loss, misuse, and alteration of information that is collected from customers, Living Products, LLC, has appropriate physical, electronic, and managerial procedures in place. Living Products, LLC, may use customer information to provide its customers with system information or information about new or upgraded products. Customers may opt out of receiving notices of new or upgraded products from Living Products, LLC, and Living Products, LLC, partners by filling in the subject line with the word "REMOVE" in the link below. Your e-mail address will be removed within 72 hours. However, customers may not opt out of receiving information from Living Products, LLC, which is essential for maintaining or updating customer’s accounts or system information. All other customers may access and modify their personal information by contacting Living Products, LLC . Living Products, LLC, will not otherwise disclose its customers personal and account information unless Living Products, LLC, has reason to believe that disclosing such information is necessary to identify, make contact with, or bring legal action against someone who may be causing harm or interfering with the rights or property of Living Products, LLC, Living Products, LLC's customers, or others, or where Living Products, LLC, has a good faith belief that the law requires such disclosure. It is necessary in order to provide service to the customer. It is necessary to protect the legitimate interests of Living Products, LLC, and its customers. It is required to cooperate with interception orders, warrants, or other legal process that Living Products, LLC, determines in its sole discretion to be valid and enforceable. It is necessary to provide to a law enforcement agency when the contents are inadvertently obtained by Living Products, LLC, and appear to pertain to the commission of a crime. Living Products, LLC, disclaims any intention to censor, edit or engage in ongoing review or surveillance of communications stored on or transmitted through its facilities by customers or others. Living Products, LLC, will, however, review, delete or block access to communications that may harm Living Products, LLC, its customers or third parties. Living Products, LLC, has a generous return policy. If you are not satisfied with our product, simply return the product within 30 days, undamaged, for a full refund. If your purchase was charged to a credit card, your refund will be credited to your credit card account. If your purchase was paid by cash, check, or money order we will issue a check as refund back to you. You should receive refund within 2 weeks from the date we were notified.